Edith & I is a travelogue which spans time as well as distance. In 1900, an English anthropologist named Edith Durham traversed the Accursed Mountains into Kosovo, shaded from the Balkan sun by her tam o’shanter. She was honoured for her humanitarian work and for championing the unity and independence of Albania. One hundred years later and another Englishwoman, Elizabeth Gowing, is working in Pristina, Kosovo where her local friends and students occasionally compare her to a certain AyDIT DourHAM. This is puzzling to Elizabeth – and then flattering once she learns who Edith Durham was. We are given a synopsis of the Edwardian woman’s life, neatly, through a cloze passage Elizabeth completes with a student. Elizabeth reads Edith’s High Albania and feels “the faltering beginning of a relationship”, finding familiarity in many of Edith’s thoughts and experiences and warming to “her sense of humour, her intrepidity, her frankness”. It’s when Elizabeth finds herself back in London, out of sorts and missing Kosovo, that her journey into the past, into Edith’s life, truly starts. Empathising with a melodramatic line of Edith’s (written during her stifling years in London spent caring for her ailing mother), Elizabeth sets out to learn not about Edith the Queen of the Mountain People at first, but Edith “the rather stout lady stuck in Hampstead”. Elizabeth’s descent into archives and museum storage is reminiscent, for me, of the academic pursuit (as both activity and action) that takes place in AS Byatt’s extraordinary novel Possession. Of course Edith & I is non-fiction and Elizabeth is racing neither against the clock nor rival scholars in her quest for information. Neverthess she maintains pace and suspense by making Edith three-dimensional to the reader as she becomes three-dimensional to Elizabeth. First there are photographs and postcards, then Elizabeth finds Edith’s traditional ‘opinga’ shoes, “which could have just been scuffed off by her while she popped in for a coffee”. The scene in the British Library when Elizabeth listens to a recording of Edith’s voice, captured on wax cylinders in Albania, gave me goosebumps. 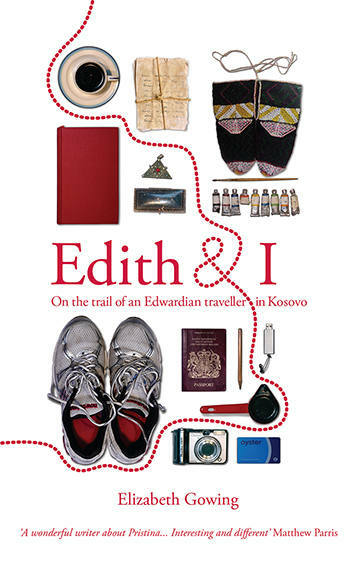 As Elizabeth’s journey with Edith progresses, we read excerpts from old diaries, letters and notebooks; are bumped along Kosovan roads in a ‘motokultivator’ (“the most basic form of self-propulsion possible”); enter the homes and lives of people directly connected to Edith. From Elizabeth’s retracing of Edith’s steps (backwards) through the Rugova valley, to her visiting an old Serbian monastery, there is plenty to sate the appetites of readers who enjoy travel writing. We learn more about what drives Elizabeth, and see parallels between the lives of the two women, but Elizabeth always reserves centre stage for Edith. There must come a sense of responsibility in reanimating a person from fragments, letters, objects. Elizabeth does this sensitively, speculating a little but usually allowing Edith to shine through in her own words and known actions. I empathised with Elizabeth’s desire to find a love interest for Edith, to learn whom she “shared intimacy, or adventures, with”, as this is so often the key to a person’s essence. Through Elizabeth’s warm writing, borne from thorough research, it’s obvious how fond of her “strangely endearing” subject she becomes, treating her with tenderness and compassion; refusing to make assumptions. Even views of Edith’s that modern readers might find unpalatable, Elizabeth sets in historical context, achieving that delicate balance of neither condoning nor condemning. Elizabeth’s writing, as always, is compelling; her narrative persona humble and likeable. For me, not a page passed in Edith & I where I didn’t smile at the beauty of a sentence or comical or wry observation: “perhaps we are all incongruous in our love letters, just as we are in our dressing gowns”. The last two chapters in particular soar and achieve something, I believe, good travel literature should do: transcend their immediate subject matter to say more about people, families and the complexities of the lives we lead. Edith & I is travel writing, history, love, and passion for a subject all rolled into one enjoyable journey. You can read more about Elizabeth – and Edith – at www.edith-and-i.com.